Fighters Club is a brutal online action fighting game from WildLabs. The game is for tough fighters who can stand a whole fight night long, and there are no rules for fighters. You can bet on your victory as well as on your rivals. If you win, you get everything. This online fighting game allows you to train and develop your fighter within the underground fight club. You got to earn money during a fight night in our illegal private Fighters Club. You can train your fighters and improve their fighting skills. Your character can master the maritial arts style and techniques that you want to develop. 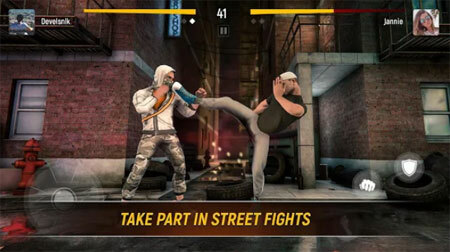 Create your unique fighting style, make your bet and become the King of the Streets. You can dress your fighter in the sport style like in Ultimate Fighting, or make him look like a Wrestling fighter. If you get stuck in the game, check out the video walkthrough and gameplay for the game. This entry was posted in Android Games, iOS Games, Mobile Games, Walkthrough and tagged Fighters Club Cheats, Fighters Club Game, Fighters Club Gameplay, Fighters Club Guide, Fighters Club Hints, Fighters Club Review, Fighters Club Solutions, Fighters Club Strategy, Fighters Club Tips, Fighters Club Walkthrough by Marvin. Bookmark the permalink.